Concordia University in Portland, Oregon, is a small liberal arts school that’s as inviting as it is career focused. 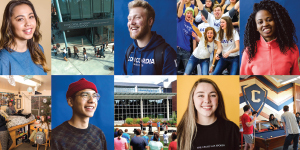 Our welcoming campus is perfect for students looking for small classes, professors who care, ways to make a difference, and a close-knit community. Ready to start your college journey at a school where you belong? Let’s go! 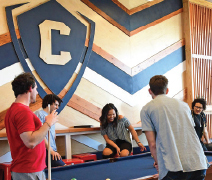 Choosing the right college is all about fit, and at Concordia University, you belong. Here professors work with you—one-on-one—to unlock your potential and help you succeed. Spirited discussions and differing points of view are encouraged. And with class sizes averaging fewer than 20 students, classmates quickly become friends. Into student government? Interested in honors? Maybe you like to hike, play Ultimate Frisbee, or get your hula on. Getting involved is as easy as joining a club, attending a game, or finding a way to lend a hand. Take the first step and we’ll meet you halfway. There are dozens of clubs, organizations, and intramural teams as well as music ensembles and choirs. At Concordia, service is more than aword—it’s a way of life. Whether it’s volunteering at a food bank, mentoring young students, providing respite care for parents with disabled children, or building homes with Habitat for Humanity, helping others is part of everything we do. Sharing our God-given talents through service is a cornerstone of our Lutheran heritage. As the Portland area’s only NCAA Division II school, Concordia University student-athletes are winners on every field. Although we’re the newest member of the Great Northwest Athletic Conference (GNAC), our winning tradition is well established across all 15 varsity sports—including conference titles in women’s soccer, men’s track & field (indoor and outdoor), and women’s golf. Concordia athletes shine off the court too—the Cavaliers are the reigning GNAC academic champions. Our small tree-lined campus is in the heart of Portland’s coolest area: the Alberta Arts District. Where else can you enjoy PB&J cupcakes, freckled woodblock ice cream, and a world atlas of dining options? Gluten free? Vegan? Locally sourced? Hello—this is Portland! And you’re never more than 90 minutes from skiing Mount Hood, windsurfing in the Columbia River Gorge, or visiting the Oregon Coast. Imagine Nursing students serving in a community health clinic, Education students helping in classrooms, Biology students working in a STEAM lab, and Business students running a food pantry. That’s the idea behind Concordia’s innovative 3 to PhD® program, created in partnership with Portland Public Schools and Trillium Family Services. The new 3 to PhD building—which houses Concordia’s School of Education and Faubion PreK-8, as well as the many labs, clinics, and centers where you can learn in immersive, hands-on environments—is just across from the main campus. The best way to find out if Concordia is the right fit for you is to visit. Schedule a tour and you can sit in on a class, talk with current students, and meet the faculty. We offer a wide range of scholarships, grants, and other financial aid opportunities to help you take the first step. 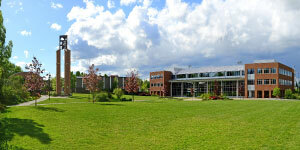 Come experience the Concordia difference for yourself!